The essence of firms creating fairness in the organization is now recognized as essential since individual perception and reactions to fairness in the organization differs. In this study, we explored the link between organizational justice and turnover intention in private security firms in Port Harcourt. The researcher examined the impact of distributive justice, procedural justice and interactional justice on job satisfaction. 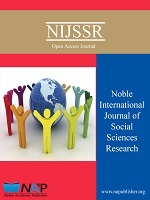 Drawing from wide range of theoretical literature, the study focused on the complexities involved in reconciling organizational justice and turnover intention through job satisfaction. The population consisted of all the private security firms in Port Harcourt, Rivers State. A sample size of 250 staff members of 10 private security firms were selected through the random sampling technique. The analysis of the findings was done using means, standard deviation, and t-test statistics (dependant sample t-test). The findings showed that there is a positive link between distributive justice, procedural justice and job satisfaction but no significant link between international justice and job satisfaction. It was recommended that both organizations and employees should ensure a balance for a win-win situation to be possible, also a study should be carried out in other organizations other than security firms in order to be able to generalize findings.